Yet he’s only played 5 so far and is a little shorter (listed at 6’8" so I’d guess he’s 6’7" without shoes right now). He’ll probably primarily be a 4 next year, but I would bet that Johns ends up spending a lot of time at the 5 post-Teske as well. And it seems that Franz is probably gonna grow another inch or two since it looks like he’s exploding through a growth spurt like Mo did. We ALSO viewed Mo as a wing when we were recruiting him. I feel like I’ve learned my lesson on that, lol. Did we? I don’t remember it that way but that was a while ago. Yeah. Just checked to confirm. All of our talk on the forums viewed him as a PF. Wouldn’t say Wagner is a ‘traditional MSU type of four man’. He’s not a great rebounder (needs to add strength) and I think he’s a bit more skilled than a ‘traditional four’. He seems like a guy that can pick and pop, drive on bigger guys and occasionally post up smaller guys. I almost think along the lines of some sort of version of Aaron White, but that’s a long ways off. I do remember people thinking he’d be a 4 when we were recruiting him. Although while Dylan describes him as a skilled 4 man, he also described his game to a T. Mo had the skills to be a 4 imo, just too slow and nonathletic. DJ would have real quick guards get by him but he at least had the agility to contest. To me Franz seems like a Brandon Johns/DJ Wilson PF that could be a small ball 5. Although with less defensive upside. Also I wouldn’t say we unlocked DJ when we had him as small ball 5, he still played way more 4. We just found that to be a good option for us if Mo was struggling. If Franz ends up filling out like Mo, then yeah he’s a 5. I went back and watched some of Mo’s vids and then watched Franz. All of Mo’s defensive highlights were at the rim. Franz looks much quicker side to side and was somewhat capably guarding professional wings on the perimeter and didn’t look out of place. DJ was a 4 all year unless Moe went to the bench. 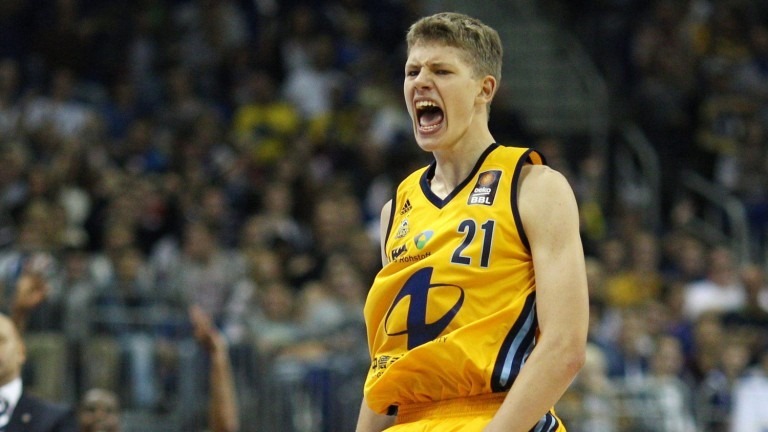 German star wing Franz Wagner could potentially follow in his brothers footsteps and play college basketball. Would be a big time get from what evan Daniels and some of the nba guys have said it sounds like he’d be a top 50 prospect. Franz has been my favorite option if we need to add someone late in the game. If Iggy leaves I’d offer Franz immediately. Sounds like his timeline will fit well with us, saying he’ll try to head stateside for visits over the summer. Okay, this sounds like it’s potentially a real thing. Fun. Would be a great late add but curious if he is redundant from a roster management standpoint with Wilson, Bajema and Johns around and lack of depth at the 2. If they believe he’s THAT good, then you take him and things end up working out. Bajema is versatile enough to play some two. I think he is expected to play the two. The more ball handling length we have the fewer switches we need to make, he is a take for sure in my book if we have the room. 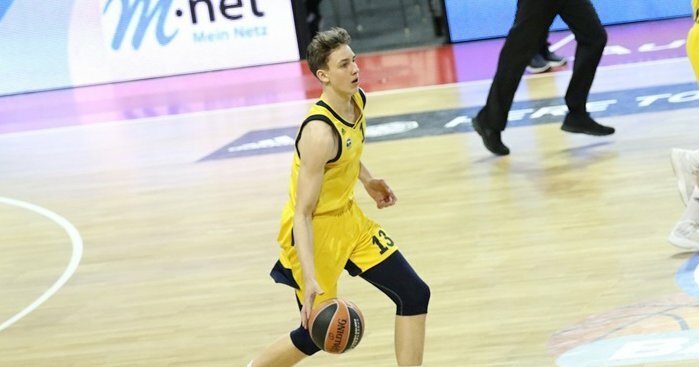 Potential 2020 first round pick Franz Wagner absolutely exploded today in a do-or-die ProB playoff game against OrangeAcademy: 37 points on 16 shots in 25 minutes. Hit six 3s. He's been really impressive all season long. If he wants to play in college, you gotta think he is all ours. Convince him to play here to get acclimated to the US and be a star. I don’t see this in the thread, but I just learned that Derrick Walton hooked up with Alba Berlin in February. So he and Franz are (at least occasionally) on the same team. Don’t know how much playing time they share (per Alba’s stats page Walton is averaging 20 minutes a game, but he’s only playing in Budesliga games, presumably not eligible for the Eurocup, and I believe Franz isn’t exclusive to Alba) but that would be fun. Can’t hurt efforts to scout and recruit Franz, can it?